REMINDER: Fruit and Wreath Orders are due Friday, November 13th. PIE ORDERS will be in on Friday, November 20th. Pick up time will be from 4-6pm on that date. If you can help sort and distribute the pies from 2 – 6 that day, please contact Kathy Brown at dogonekat@sbcglobal.net. 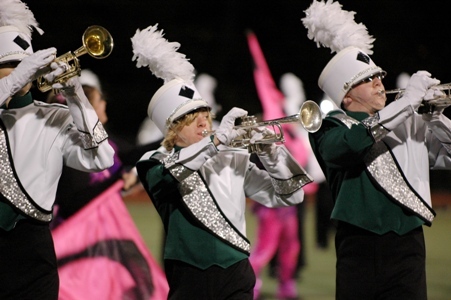 The next BAND PARENT MEETING will be on November 17th at 7pm in the Band Room. FUNDRAISING – Our upcoming fundraiser, the Dinner Dance, is in need of attendees. It is going to be held at the Candlewood Valley Country Club on November 21st, the weekend between Championships and Thanksgiving. This is a great night out for adults and a nice way to end the marching band season. Please contact Sharon Chamberlin (schamberlin8427@sbcglobal..net) or Krista Roberts (krista@marketingresourcesinc.com) for more information and/or if you would like to donate a prize for the silent auction. Tickets may be purchased by filling out the attached form and putting it in the lock box with your check. The last day to purchase tickets is November 7th. The next Band Parent meeting will be on Tuesday October 20th, the third Tuesday of every month. The next Show meeting will be held on Thursday, October 1st at 7pm in the Band Room. Please make every effort to attend. PIE ORDERS...Since we have had such a great response to the pie fund raiser and wanted to be sure that everyone had enough time to get their orders in we requested an additional extension for sales. If you have already handed in your form you can continue to take orders and just put them on a piece of paper or I can supply you with an additional order form. The pie orders will now be due on October 13th. Please remember to collect payment with the orders and submit one payment for your entire order with a check payable to NMHS Band Parents. If you have any questions please feel free to contact Kathy Brown at dogonekat@sbcglobal.net or 860-566-0318. The first fundraiser is Pies and forms were given to your child last Tuesday night. The orders will be due on 10/1 and pies will be delivered on 11/20, just in time for Thanksgiving. Anyone who will be available to help tally orders or to sort the pies when they arrive on November 20th can contact Kathy Brown at dogonekat@sbcglobal.net or call her cell at 860-566-0318. The pie fundraiser proceeds will go to the NMHS Band Parent General Fund. This income is crucial to the organization. We must ensure that we have the necessary equipment and transportation in place to mobilize a group of this size. The next two fundraisers will occur at the same time. One is the Holiday Wreaths and the other is the Fruit fundraiser. The forms for both will both come out on 10/18 with orders due 11/1, and delivery on or about 12/1. If you would like to begin taking orders for the wreaths, the cost of the wreaths will be $15 (same as last year) and we will be using the same vendor. The wreath fundraiser proceeds will go to the student. $6.00 of every wreath will go towards the Chicago trip. The fruit fundraiser partial proceeds will go to the student. $3.00 of every box of fruit will go towards the Chicago trip. Our next Can & Bottle Drive is December 5th. If you would like to drop off cans & bottles at Dr. Carlone’s office, please feel free to. Otherwise, you can turn in the slips and drop them in the Lock Box in the band room.